After seeing her beloved date palm trees die as a result of the red palm weevil, Farah Al Bastaki decided to educate others about the issue. She chose a creative route, by creating a game. The red palm weevil belongs to the snout beetle species. The insect is a major menace to date palms because they lay their larvae inside the trees, resulting in the trees’ eventual death. “My devotion to date palms started in my early childhood. I grew up in a household the grew plant palm trees of the finest quality,” Al Bastaki said, explaining the close relationship she shares with the date palm tree. “This love for the date palm has not diminished and I lavished care upon them, until came the dreadful day that I heard about the existence of weevil red bug. “I was shocked and contacted the Department of Agriculture in the Municipality who informed us that once attacked by the weevil, the palm will mostly have eroded from the inside. Therefore, it was best to get rid of the infected ones to protect the younger ones, as yet not exposed to the red weevil,” she said, recounting her experience and what made her decide to create the Red Bug game app. “I thought of educating and spreading awareness to children and families in a simple manner, by informing them about the danger of this weevil through a game,” she said. “I designed the game in the form of snakes and ladders where the player climbs the palm and the weevil pulls you down and delays the progress. The enthusiasm continues to the end of the game before one player finally loses and the remaining player wins a basket full of dates,” she added, explaining how the board game works. “I chose this type of game for the following reasons — ease of steps, easy to follow, flexible as most people play their own way and on their own terms … More importantly, it offers the chance to create a dialogue between the child and his parents or his brothers and friends so they can discuss their attachment to this blessed tree and its importance in their daily lives,” she said. Al Bastaki said that educational information about the red palm weevil is also written on the back of the game’s box, and has been translated into Arabic, English, and Japanese. “I’ve written the history of the weevil on the back of the box, how and when the weevil appeared in the United Arab Emirates together with when it was first discovered. “In addition, the text and instructions have been translated in three languages — Arabic, English and Japanese. The reason for the Japanese language is to encourage my friends from the Japanese community in Abu Dhabi to enjoy this game, as they are also a cause of encouragement to me,” she added. Al Bastaki said that she would make the game available on IOS and Android devices, using technology to make the game more interactive and educational. “Three years after the cardboard game was made available, I used technology to further develop the IOS application for use on the iPhone and iPad devices as well as Android applications on Samsung devices. The new game is completely different from the previous one as it is now completely interactive and allows much more scope for learning and entertainment side by side,” she added. Al Bastaki said that the new educational aspects of the game included introducing the gamers to a variety of different dates, and how they can take care of date palms affected by the disease, a task that required in-depth research. 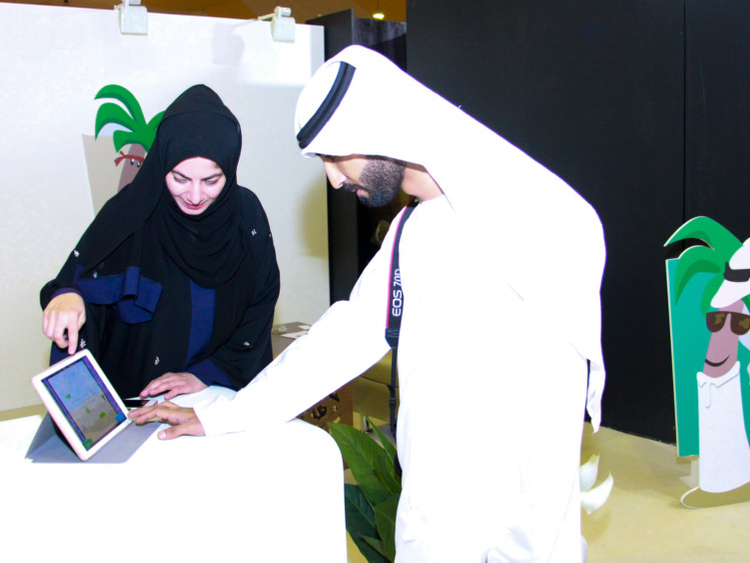 Al Bastaki, who is currently promoting the game at the Liwa Date Festival, says she is proud of her work, and noted the cultural significance of the date palm tree to the UAE and the late Shaikh Zayed Bin Sultan Al Nahyan, the founding father of the UAE.